Harmony Server has a lock system, referred to as Global Lock, for the different scenes and scene assets. Because all the data on the server can be accessed directly and modified from any client machine by default, the scenes are locked. You must obtain the rights to modify scenes in order to save your work on the server. Only one user at a time can modify a scene. 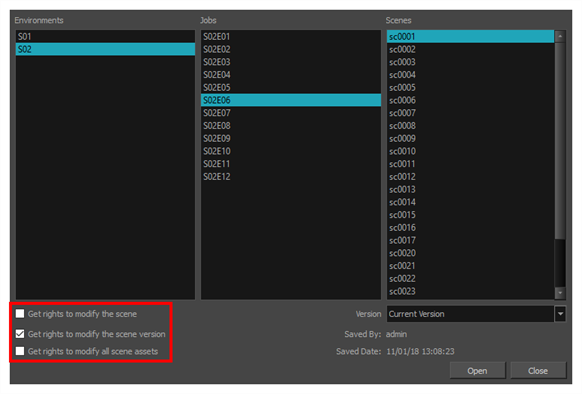 Once a scene is opened on a client machine, other users can only open the scene in read-only mode. They will not be able to save any modifications. If you work in standalone mode, you automatically have the rights to modify all drawings and palettes. Global Lock offers three levels which are available from the Database Selector when you log in to Harmony. From there, you can select a scene and obtain the rights to modify it by selecting the desired lock option.